For the inaugural week of the Fondation Louis Vuitton, all the artworks of the first hanging has been revealed. Among them, a series of works by Gerhard Richter, showcased in one of the rooms of the building, tell the creative journey of the artist. 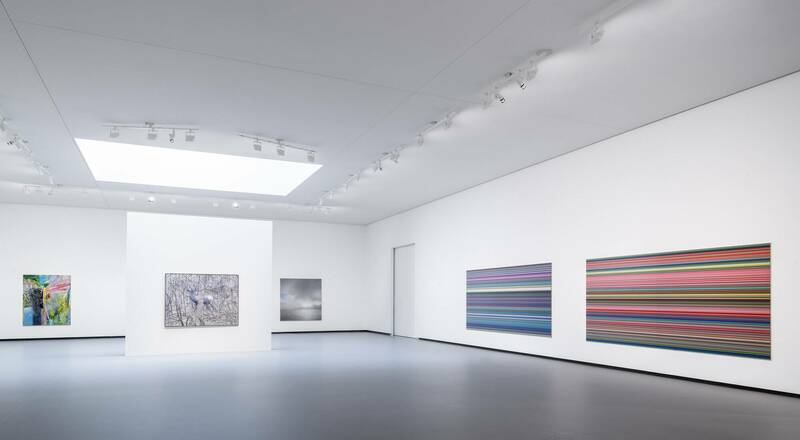 The galerie 5 is exclusively dedicated to Gerhard Richter’s work. The visitor will see smoothly finish paintings, reproducing photographs, but also works exploring the possibilities of abstraction. Drawn from an old photograph taken years before, Hirsch (1963) is one of Richter’s most singular artworks. The smoothly finished Seestück (Leicht bewölkt) (1969) belongs to a body of seascapes in which Gerhard Richter reassesses Romantic painting and specifically Caspar David Friedrich’s work. 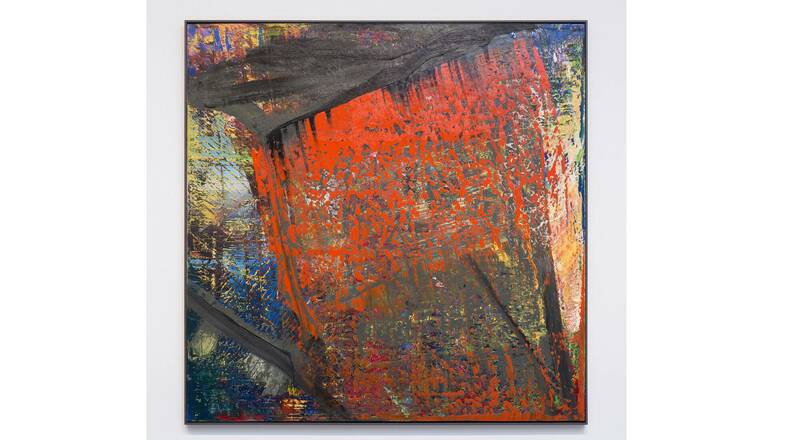 Since 1964 Gerhard Richter has never ceased to investigate abstraction’s various possibilities and vocabulary. Rare or discreet until 1971, since 1979 color has become generous and dazzling in his work. Used as a thick paste, scraped across the surface of the canvas, pigments multiply and become iridescent in a wide variety of shapes and contrasts. If the first impression is one of chaos, it is in fact rigorously structured. In Wald (1990), a broad horizontal motion rips through a thick black veil to reveal successive strata of bright colors (yellow, blue, red) a characteristic trait of the squeegee that gives way to sensual shimmers and blurred effects. The artist’s yearning for profusion is counterbalanced by paintings that are nearly monochromatic. 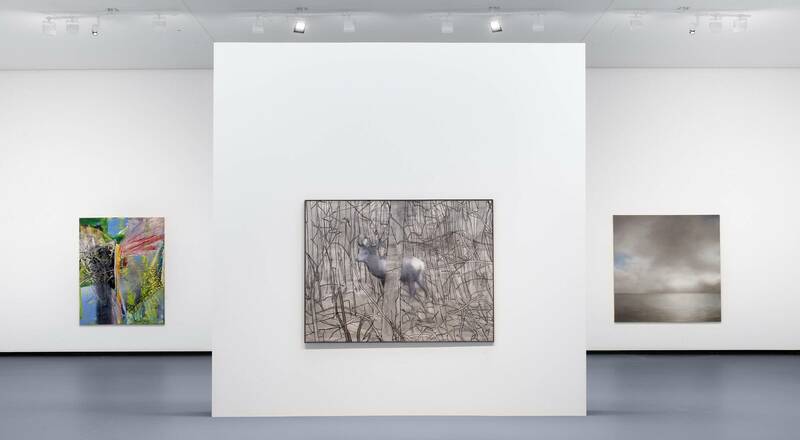 Thus, in his series titled Weiss created in 2006, white oil paint is irregularly stretched onto creviced, scraped, and cracked aluminum, revealing a black undercoat here and there. Conceived in 2011, the Strip series illustrates the artist’s interest in new technologies that redefine notions of the pictorial concept and the conditions that lead to its realization, particularly through computer modeling of color combinations. This series of 72 digital prints was created from a scan of Abstract Painting (724-4), a painting from 1990 in which superimposed layers of pigments were applied with a squeegee. With the help of a software program, the scan is divided vertically into two strips, then four, eight, 16, 32, resulting in 8,190 strips that become progressively narrower. Since the beginning of his career Gerhard Richter has explored the parameters of photography and the repercussion of that medium on his pictorial practice, continuing today to reflect on how the art of painting resists new media.